When I grow up I would like to be an artist in France. The reason is because I like to draw. I would get my money from the pictures I would sell. I hope I will be one. 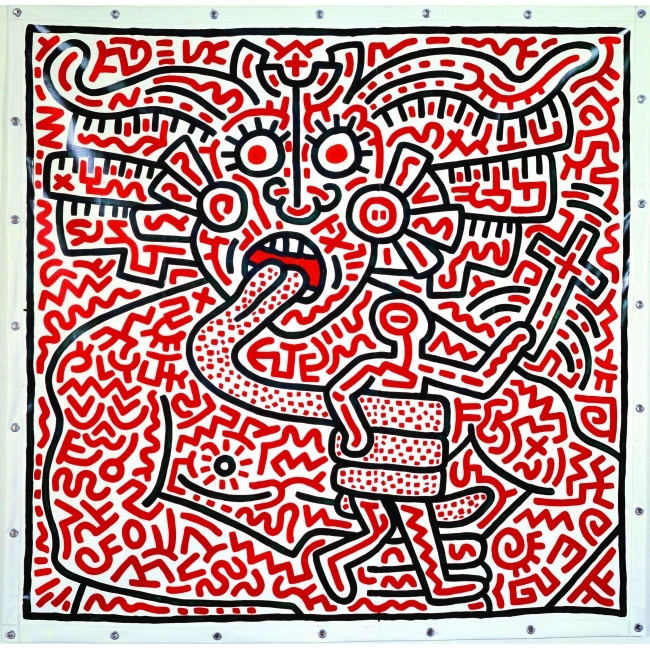 When he came of age in the '70s, Paris was no longer an art world center, so Haring went to New York. And by then, his motivations had become more complex: his desire to be an artist now stemmed not solely from his love of drawing, but at least equally strongly from his desire to protest the injustices he saw in the world. The results of Haring's efforts are currently on display in Paris, in a large retrospective of his work at the Musée d'Art Moderne de la Ville de Paris. Keith Haring, at work in a 'Pop Shop' (ca. 1983). Image courtesy of the Ludwig Museum of Contemporary Art, Budapest. Haring was a conceptual artist, whose goal was to communicate his ideas. He recorded in his journal that he thought in poems, and painted them instead of writing: "Paintings can be poems if they are read as words instead of images." Having grown up in a conservative military family in rural Pennsylvania, it is perhaps not surprising that as a gay activist in New York he championed the rights of individuals: "Individuality is the enemy of mass society." Art was the vehicle: "Art is individuality." 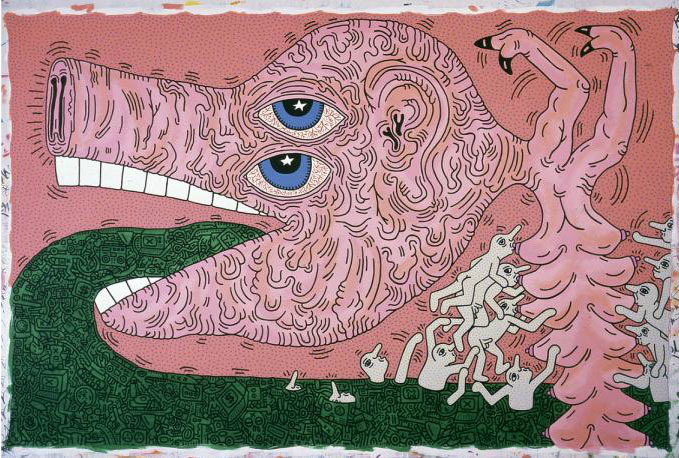 During a career of barely a dozen years from his enrollment at New York's School of Visual Arts in 1978 to his premature death from AIDS in 1990, Haring's enormous energy and drive combined to produce a vast body of work, ranging from small drawings and collages to wall-sized paintings on vinyl tarpaulins. 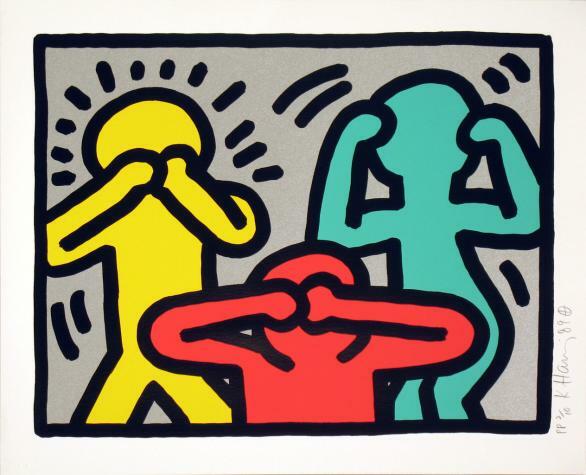 Keith Haring, Silence = Death (1989). Image courtesy of the New York University Library collection. Haring wanted to democratize art. To this end he developed his trademark visual language, based on his early love of cartoons, with heavy black outlines, simple contours, and primary colors. He settled on this style very early, then made few changes. 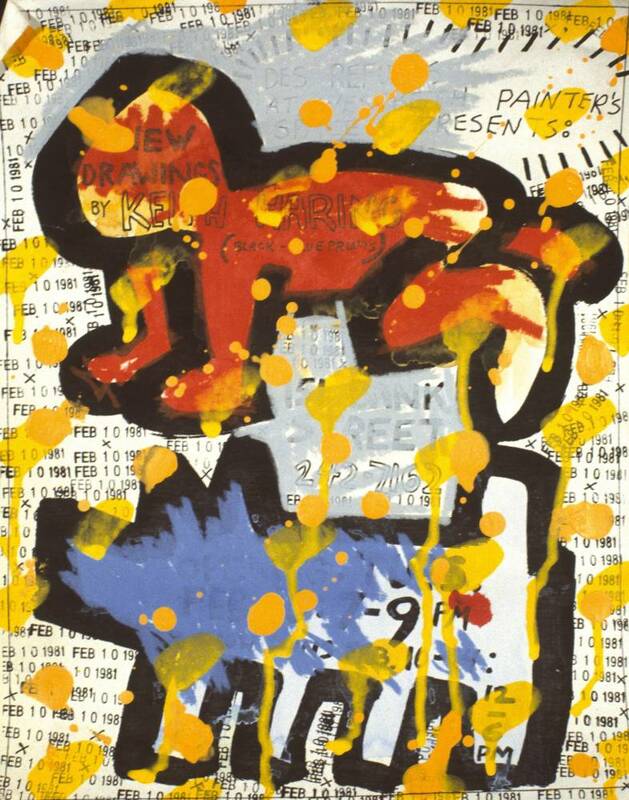 Henry Geldzahler wrote admiringly that it was as if Haring had been born with his mature style. But this is of course another way of saying that Haring's style failed to develop or grow over the course of his career. 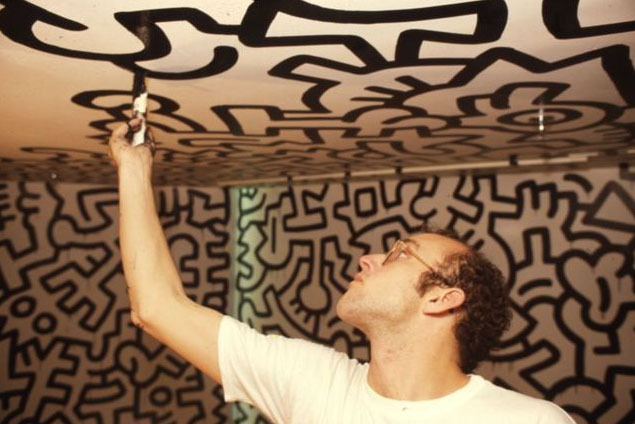 Haring's paintings are often agitated, with vibration created by allover designs that closely pack large spaces; he listened to hip-hop music while he worked, and the suspicion that he worked very quickly is confirmed by the fact that even large paintings are often signed and dated to a specific day. 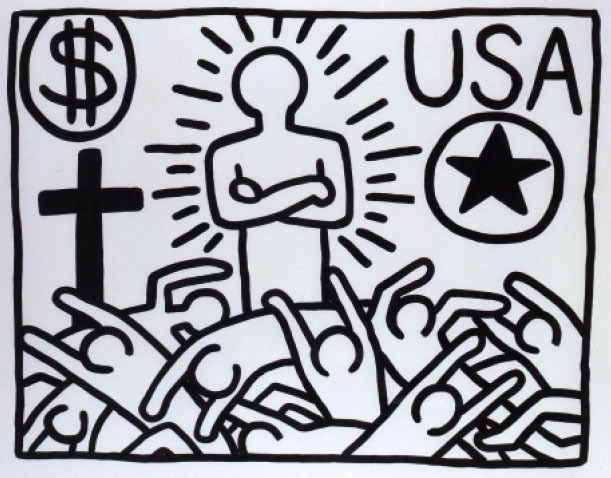 Keith Haring, Unititled, August 25, 1983. Image courtesy of the Musée d'Art Moderne del la Ville de Paris. Haring's interest was less in form than in content, what was said rather than how it was said. Much of his art was made to protest a wide variety of evils — the dangers of nuclear power, the damage of AIDS and crack cocaine, the destruction of the environment, the abuses of organized religion and corrupt politics, the injustices of homophobia and racism, the tyranny of imperialism and colonialism, and more. Curiously, one of his targets was American commercialism: he made large paintings that showed rivers of dollar bills and consumer durables spewing out of the mouths of monsters. There is some irony in Haring's distaste for commercial culture, in view of the origin of his art in the highly commercial genre of comics, his frequent use of such commercial platforms as billboards and posters, and his sale of his work at stores he named Pop Shops. When Haring's impact is carefully examined, it would not be surprising to learn that his greatest influence has been on advertising and other forms of commercial art. The lack of subtlety of his style and messages may have limited his impact in other domains, as the extreme simplifications of his art circumscribed its aesthetic and intellectual implications. 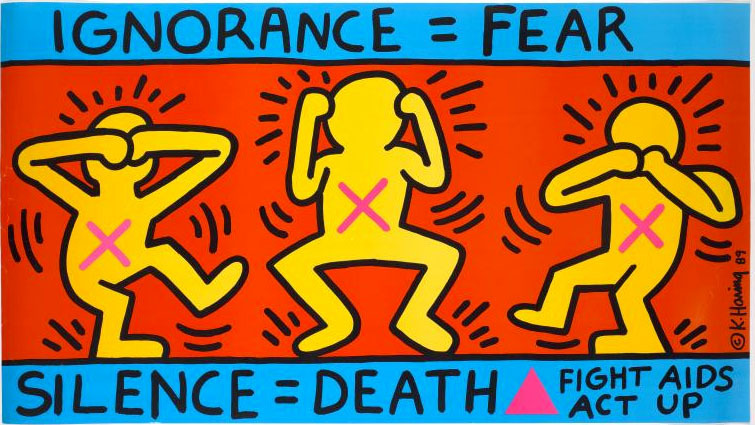 Haring's art, and thought, expressed opinions that were strongly felt, but not deeply explored. Keith Haring, Pop Shop Quad III (1989). Image courtesy of the Mildred Lane Kemper Art Museum at Washington University in St. Louis, MO. He challenged the whole commodity-oriented direction of the Art world by beating them at their own game...I honestly think he was the most important artist since Picasso. I never really thought anyone understood how to build on Andy's achievements, except Andy, and maybe me. Warhol loved making money. In THE Philosophy of Andy Warhol, he wrote: "I have a Fantasy about Money: I'm walking down the street and I hear somebody say — in a whisper — 'There goes the richest person in the world.'" In a 1966 interview, he commented that he had no objection to comparisons of his paintings to such fashionable commodities as clothes and cars: "I don't think there's anything wrong with being fashionable or successful." He loved the art market, in part because of a fascination with the process by which art was transformed into money. His friend and biographer David Bourdon wrote of "Warhol's persistent wish to achieve a sort of artistic alchemy, transforming ordinary paint into actual cash. Warhol loved few things better than to barter his art for objects that had more value, at least in his eyes. He honestly yearned for the power to transmute virtually anything he touched into something of greater financial worth." Keith Haring, Flyer for Des Refuses at Westbeth Painters Space (1981). Image courtesy of the Brooklyn Museum and the Huffington Post. The art market is one of the most dangerous, parasitic, corrupt organizations in the world, next to the Roman Catholic church or the justice system in the United States. Haring evidently could not follow Warhol in enjoying his success in the art market, in the way he conspicuously enjoyed his celebrity. Perhaps it was not in his nature as a rebel to enjoy the products of any organized institution. Haring's art and writing show him to have been a decent and well-intentioned person, and it is unfortunate that as an adult he could not fully enjoy his success in carrying out his childhood goal of doing something he loved to do, and supporting himself from the money it generated. At a more general level, it is disappointing that the superficiality of his distaste for the commercialism of American culture appears to have made him unable to comprehend that this was a product of the very prosperity that allowed him and countless others the freedom and opportunity to develop their abilities and realize their aspirations as individuals. Keith Haring, Untitled (1984). Image courtesy of the Broad Art Foundation, Santa Monica, CA.